In a very unique and interesting event held in the city, Faheema Kathoom, was crowned the winner of the 1MG-Lido Mall’s Foodie Fiesta Season Five. Several local and very talented artists participated at this year’s Foodie Fiesta Cooking Competition. Each artist had to create an original creation of a Mexican dish and plate it at the venue. Commenting on the event, Chef Savon from Foodhall and one of the judges of the cooking competition said, “This year was a tough call on the judges but at the end of the day our winner was Faheema Kathoom who recreated the dish with healthy ingredients and ensuring a fusion of Mexican flavors in her own creative way”. “The Mexican pantry is really vast. There’s an endless requirement of chillies and spices, a lot of nuts, seeds and dried fruits – all key ingredients in the Mexican cuisine. It was great to see so more of the traditional fare being re-created by the contestants. The winner of the Foodie Fiesta cooking competition season five Faheema Khathoom was awarded for the use of Mexican flavors, presentation, plating, response to the interactive discussion, knowledge of the cuisine, preparation process etc. “Sharing happiness through food is important to ensure a close bond with our community. The Foodie Fiesta at 1MG- Lido Mall is all about bringing our communities closer together and re-discovering good health and the joys of good food”, commented Suman Lahiri, COO – 1MG-Lido Malls. 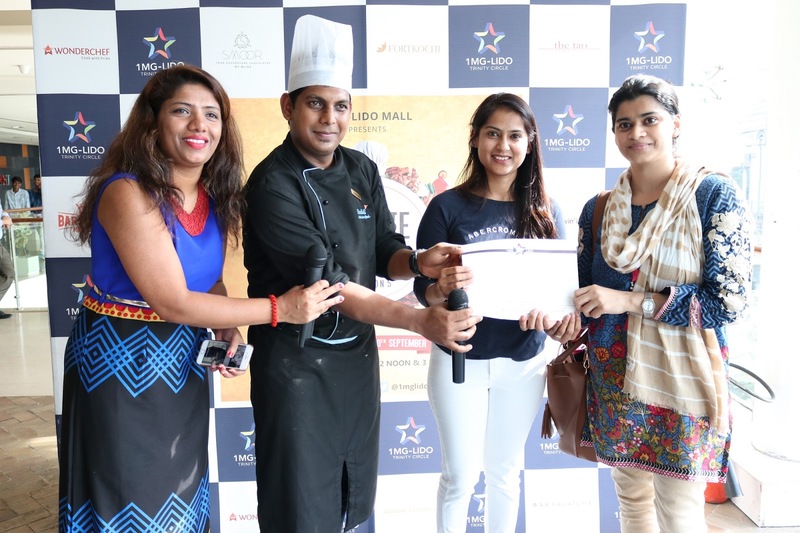 Also commented Bhanu Praveen, Marketing Manager – 1MG – Lido Mall, “We received over 45 entries and our judges have sure had an incredible time in judging these sumptuous Mexican dishes. It was great to have an interactive session between the judges and the contestants and for the audience to learn so much more of the Mexican cuisine”. Sridevi, one of the contestants at the Foodie Fiesta Cooking Competition commented, “I wanted to try something new and hence used a different sauce with pinto beans. Just being part of this event gives me a great thrill and has been such a memorable experience”. The winner Faheema Khathoom who prepared Tomato based chicken enchiladas incorporated a variety of Mexican flavours into a single meal. She had also made her own version of Mexican spices with bell pepper, grilled tomatoes and home made sour cream. Added Faheema, “I have also used sour cream which took me over 2 days to prepare. But I guess all my efforts have been worth it today!”. Another contestant Rashmi Dugar commented,”I prepared a desert with almond chocolate and Banana boats. I revamped the dish and recreated the whole process keeping in mind the health perspective. I am also the south zonal winner for Big Bazaar and am glad to have made it here today as well”. Another enthusiastic contestant Neha Gupta who presented the Mexican burritos created a different style making the desert using healthy ingredients. Also commented Divyashree Ravishankar who also took on the role of judging the competition, “Really wonderful to see innovative and creative concepts in the Mexican cuisine used by the contestants. Each one is a winner in their own ri It is great to see working women spending time to curate new dishes and balance their children and work at the same time. Today’s event at the 1MG-Lido Mall cooking competition is testament to that”. The Foodie Fiesta was a culinary series being organised at the 1MG-Lido Mall to showcase the best of Food and Beverages comprising Indian, Coastal Cuisines, Continental and Chinese. The five - part series provided an opportunity to enjoy these exotic and gastronomic treats through the month of September 2018.